Proud to report Milwaukee carried the ANZAC colours to victory in his second win on the straight course at Flemington on Wednesday. Coming with a strong run towards the stands side passing halfway, Milwaukee reached the lead inside the final 200m and stayed on powerfully to defeat Sir Donald by one length with A Mist Opportunity a long neck away third. Mike Moroney said the firmer track made the difference to Milwaukee, who was unplaced at his previous start at Caulfield on a soft surface. “The firmer track definitely helped and he got a great ride from Jack Martin,” Moroney said. Moroney has always held Milwaukee in high regard and will now spell the son of Fastnet Rock to prepare for the spring. “He was always going out after today, win, lose or draw,” Moroney said. “He’s had two starts on the straight track and won them both which is a good track to like. 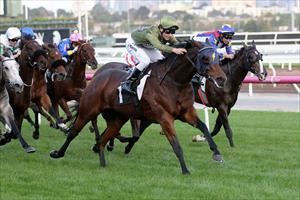 “He’s probably a 1400 metre horse but I think it takes a strong horse to win up the straight. “He’s done a good job this preparation - we sent him to Queensland chasing the Magic Millions and he raced in Sydney before coming home. Martin said the win was as good as it looked. “He’s been a good horse to me and he won impressively again today,” Martin said.